We supply various manufacturer's engineered lumber products and can get almost any engineered product you might need. We will deliver these to your site in most cases within 3 days of the order. Contact us with your specifications or let us run your engineered product through our engineering program to make sure it is the correct product for the job. If you want, we can design the floor or roof system for you including all the headers and beams needed for the project. 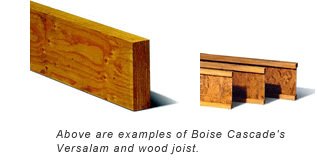 Our main suppliers of joist, headers, and beams are TrusJoist MacMillan, Boise Cascade and Georgia Pacific.